I am SO excited to share this recipe. It tastes so good, very similar to pumpkin pie, and I really think you guys will love it. I am a sucker for all things pumpkin during the fall. I posted my favorite Homemade Pumpkin Spice Latte recipe a while back. I decided that along with a yummy pumpkin drink I should come up with a yummy pumpkin bread treat. 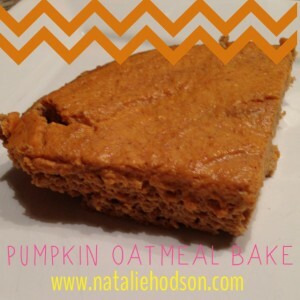 This recipe tastes really similar to pumpkin pie! I made a pumpkin butter spread to go on top. Apple butter is one of my favorite things, and I figured I could make something really similar with pumpkin to make this bread nice and moist. It worked great! The bread by itself is good, but when you add that pumpkin butter on top it just seals the deal and gives each bite the pumpkin pie texture I was hoping for. This would be a great food to eat post workout or in place of a small meal during the day. Pour the pumpkin bread ingredients into your greased pie pan. Then using a rubber spatula evenly spread the pumpkin butter on top of the pumpkin bread batter. Bake for 22-25 minutes. You can tell it’s done when a knife comes out clean, but the butter will not totally set and will stay a little wet even when cooked all the way, so you will want to stick the knife in a part of the bread that doesn’t have the pumpkin butter on it.